Americans held their breath when they learned that Euna Lee and Laura Ling were captured by North Korean authorities and held indefinitely. The journalists had been gathering stories of people fleeing North Korea's oppressive regime. When they briefly crossed the border from China into North Korea, they were apprehended by soldiers. Lee and Ling were separated and faced interrogation and the uncertainty that they would ever see their families again. The World is Bigger Now is the story of Lee's experiences in North Korea and the ways in which she was changed forever. This is an interesting read but it lacks any real tension. Even if you didn't follow the news closely, you can tell just from the cover that Lee will be released from her imprisonment. Lee also writes with some journalistic detachment. While you may be interested in her story, you never feel really invested in her. Part of this may also be self-preservation. I can only imagine how difficult it must be for Lee to revisit the darkest days of her captivity, so far away from her husband and daughter. The most interesting part of this book is learning the stories of the North Korean refugees who were interviewed by Ling and Lee. They believed in the film they were making when they started, but as they met people who had fled for their lives they found renewed commitment. I think that anyone reading this will finish the book with a deeper understanding of the current situation in North Korea. That being said, Lee does a wonderful job of showing a human side to her captors. Even while they are holding her captive, she finds moments to share with these people who are simply doing their job. The World Is Bigger Now is an inspirational book. It's a story about a woman who trusted in God to get her through incredible circumstances. Lee's faith is an integral part of how she got through her ordeal. It's a realistic look at belief, though. Lee's relationship with God is ultimately strengthened through this experience, but it's a journey that has many bumps along the way. As she sits alone and wonders what her future will be like, she can't help but wonder if God has abandoned her. While this book has faith running throughout the whole story, it can be appreciated by readers of all beliefs. 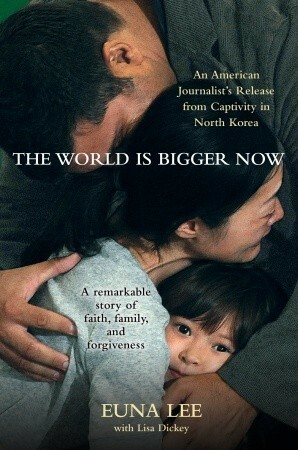 This is a good read for anyone who is interested in the plight of the North Korean people. While Lee is not the most captivating writer, her story is still inspiring for the ways in which she truly committed to the people she had interviewed, the kindness she bestowed on her captors in spite of everything, and the ways in which her experiences caused her to reevaluate what is truly important. I am so totally going to read this :) I already put it on my list last time I noticed it on your blog! It wasn't my favorite read, but it did make me think about a lot of things.